The Indigenous People of Biafra IPOB African Representative, George Onyeibo was yesterday morning, illegally arrested by the Nigerian DSS in Igweocha (Port Harcourt, Rivers State). According to Mr George's personal assistant, Miss Chimaobi, George travelled to Igweocha on Friday after an official assignment to be with his family. On Saturday morning, he called the personal assistant Miss Chimaobi and gave her some assignments and promised to call back later for the feedback. However, when she didn't hear from him as he assured, she put a call across to him severally around 11am, the calls were not answered or returned. At midday, one Mr. Timothy, who according to Miss Chimoabi is Mr George's close friend called her and gave the information that Mr George's car was spotted parked at one gas station in Igweocha with George nowhere to be found. Moments later, some DSS officials pulled up to the synagogue where Mr George worships and fearlessly walked around the auditorium even as the service was going on, disrupting the service and giving scores of worshippers freight. When some elders approached the DSS and enquired of their unusual and highly disturbing presence in the synagogue, they simply said they came to fellowship with them. With heavy arms and uniforms! 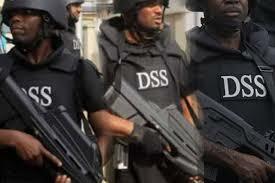 When the DSS left the synagogue, at about 1pm, they drove straight to Mr George's residence, brought him out of their black jeep blindfolded and handcuffed, seized his wife's fones and searched the whole house and compound even without search warrant! They simply told the wife they got the report that Mr George manufactures explosives in his house. When their illegal search yielded no result, they bundled George back into the black jeep they came with, still blindfolded and handcuffed and drove hurriedly out of the compound to an unknown destination without uttering any other word.